Half of Small Business Owners Are Missing Out on the Benefits of Email Newsletters. 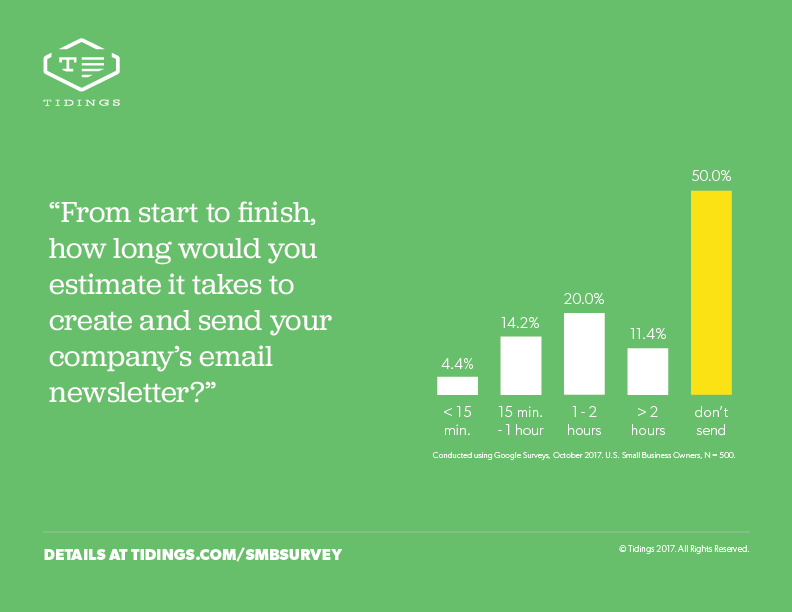 From start to finish, how long would you estimate it takes to create and send your company’s email newsletter? The results validated the rationale behind our product: newsletters simply take too long to send for most businesses. Half of Small Businesses Don’t Send a Newsletter. It’s entirely reasonable — business owners are busy running their businesses, and for many, the time investment is just too big a hurdle to check even a critical marketing box like a newsletter. Of the businesses who do send, 62.8% spend more than an hour each time, and 22.8% spend more than two hours. This squares entirely with my experience in the first 44 weeks of sending a newsletter: even with a great interface like Mailchimp, I found myself spending 90-120 minutes each week re-creating my template, coming up with content, formatting that content, downloading images, uploading images, testing my formatting–it was too much! It was literally so frustrating that I decided to start Tidings. Of all age groups, older millennial business owners (ages 25-34) actually spend the longest on their newsletters. I figured digitally-savvy millennials would take the least amount of time to send an email newsletter. But given the overwhelming preference of this age cohort to receive company-to-customer communication via email, it perhaps makes sense that they’d place more emphasis on this channel with their business-owner hat on. Why Send an Email Newsletter? Two of the most widely-cited stats in digital marketing are email’s 44:1 return on investment (ROI) and 40x performance vs. social media at acquiring customers. While those numbers don’t necessarily capture the time investment required to be successful at email marketing, the benefits of marketing to your customers via regular emails are simply too awesome to ignore. Professional marketers rank it #1 in this survey from MarketingCharts/Ascend, and small business owners consistently rank it in the top three channels on surveys from research companies like the Local Search Association and StreetFight. Producing deep original content or commissioning expensive original research are of course the best ways to build your reputation as an expert. But most small businesses have neither the time or money to do either one. So sharing your perspective on key industry trends or upcoming events is the most realistic and effective way to demonstrate your expertise–and build trust with your prospects and loyalty with your customers. Obviously, it’s your product or service itself that’s primarily responsible for driving word of mouth: still far-and-away the most effective customer acquisition channel. But if you’re in a business with months or years between typical transactions, it’s hard to earn those referrals unless you stay top-of-mind and maintain a relationship with your customers in the interim. An email newsletter is a great way to build that relationship. While social media grabs all the headlines, building your email list is actually the most effective way to grow your audience. While social media companies own your followers, you own your email database. And with open rates in most industries exceeding 20%, far more email subscribers than fans will see a given piece of content that you share. Somewhere between 40% and 48% of your audience wants your marketing to be more informative — so even if you’re seeing success with your promotional email program, consider integrating a newsletter as part of your overall marketing mix. While great services like Lob are making direct mail easier, there’s still plenty of work involved in gathering assets in print-quality resolution, coordinating with a printer–and of course, dealing with the United States Postal Service. Email, though, has a higher ROI than direct mail and gets the best response rate — especially if your audience skews younger. Companies that publish newsletters on their website (a one-click task for Tidings customers using our WordPress plugin) can also draw in future customers with their content. The simple act of publishing won’t necessarily help you rank better in search results, but as long as your content is relevant to what you sell, posting your newsletters to your website can help you rank for a broader range of keywords, and help give Google and Bing more context around your products or services. If you’re among the 50% of small business owners not yet sending a newsletter–or the 91.2% spending more than 15 minutes to send one, I encourage you to give Tidings a shot. Our product makes it easy, fast, and dare I say fun to send your weekly or monthly newsletter. Just enter your Facebook Page URL above, and we’ll give you an instant preview of what your newsletter can look like. Signing up gives you a free 21-day trial, and access to more bells-and-whistles like our aforementioned WordPress Plugin, browser bookmarklets, integration with email service providers, and more. Regardless of whether you use Tidings for your newsletter or not, thanks for reading & best of luck with your email marketing!